Former Bridlington resident Fiona Edwards returns to the Old Town with her Derbyshire art group Pleasley Art Explorers for an exhibition at Gallery Forty-Nine. The group formed in 2015 meet in the Verney Institute, the local village hall for the Derbyshire village of Pleasley. The friends initially met at Bolsover Adult Education Centre where they were involved with various art courses run through the Limestone Journeys project. A very creative art tutor encouraged the participants to engage with their local surroundings and then experiment with a wide variety of materials and techniques to produce a range of artworks. After this project ended, the group were keen to carry on “doing their own thing”. They continued to meet regularly to exchange ideas, techniques, and strive to develop their own visions of the world around them - hence the exhibition title of 'Mind’s Eye'. Although each member of the group has come from a different background, they are drawn together by their shared enthusiasm for trying out something different and an appreciation of their surroundings. Fiona thought that Gallery Forty-Nine would be an ideal venue for the group to showcase their work and has encouraged the other members of the Pleasley Art Explorers to realise their first exhibition. Paintings, prints and mixed media pieces will be on view and for sale in addition to woodcarvings by guest artist Melvin Savage. Fiona Edwards trained in Textiles at Edinburgh College of Art and was eventually to spend twenty four years living in Bridlington, many of those as the owner of a guest house. Despite a hectic lifestyle, she kept her interest in art alive in precious spare moments. 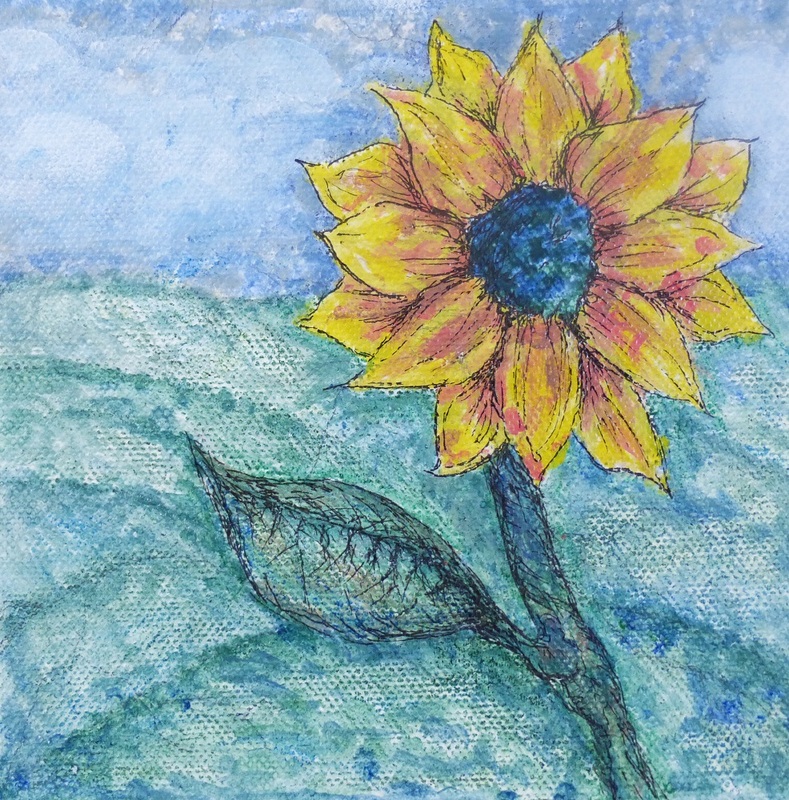 Much of Fiona’s work is of an abstract and thought-provoking nature. Jackie Dyson is a retired primary school teacher who has always been interested in all areas of art and textiles, but never had the time to develop this hobby. 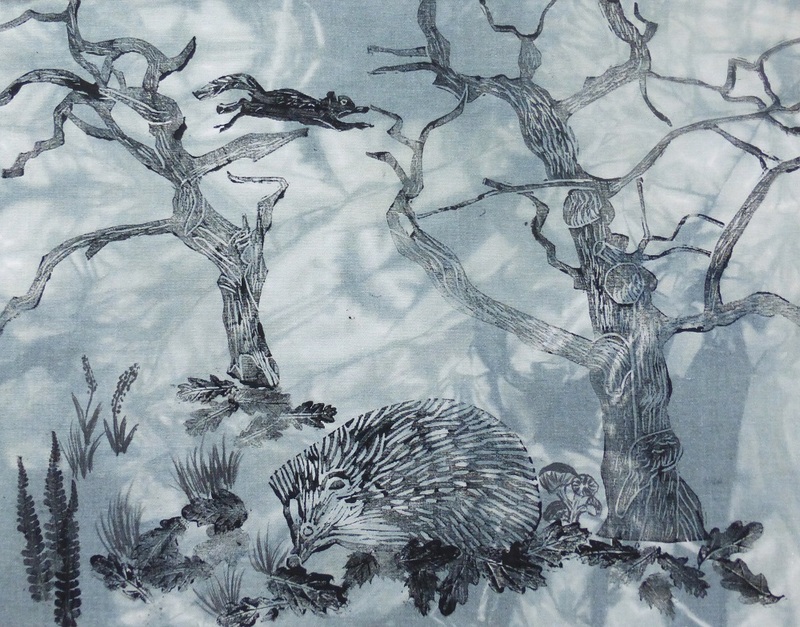 After kick-starting her basic skills with local art classes, she decided to combine her love of walking in Sherwood Forest, with its ancient oak trees and varied animals, with a growing interest in printing on fabric. Jackie has used this woodland landscape as inspiration for a series of mixed media prints. Val Gamble is a retired teacher of art in secondary schools spent many years encouraging others to be creative but found little time to devote to her own work. Each year she designs and leads a team to make the local Well Dressing, a Derbyshire tradition of immense skill and beauty. Val has a particular interest in shape and colour and has chosen to interpret some aspects of memories of holidays on the Yorkshire coast in print, watercolours and mixed media. Originally from Cornwall, Michelle Scott arrived in Bolsover via Mersyside and after leading a busy life eventually found time to take up an interest in arts and crafts at the local Adult Education Centre. 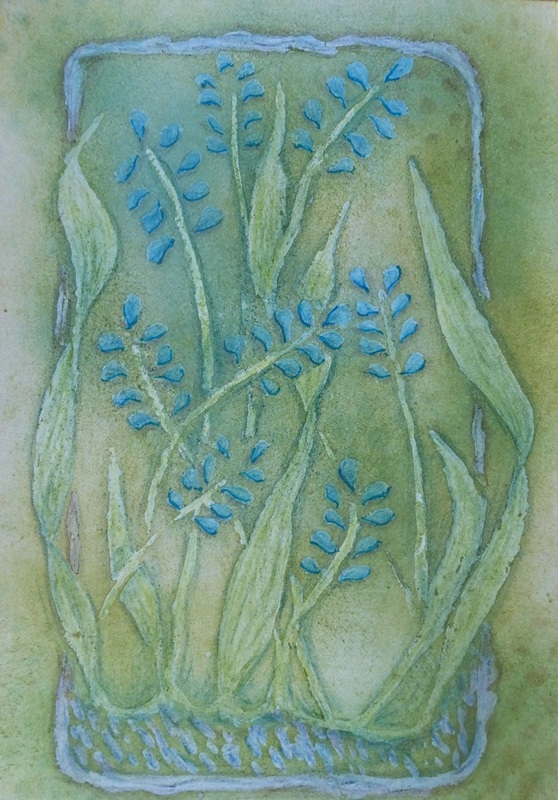 Michelle draws her inspiration from the natural world and works with a crafts emphasis, and loves trying out new methods. Hayley Hallowes is a newcomer to the group and she is enjoying the challenge of getting to grips with different media and growing in confidence to produce her own work. Melvin Savage started woodcarving as a hobby whilst involved in the carpet trade. Through business he acquired furniture-making and woodworking skills which eventually led to him becoming so accomplished that he now teaches woodcarving to others. His work will be on display and be available to order.